The benefits of gel and foam are well documented. A high-density foam shell surrounds a uniquely styled gel bladder to form a comfortable gel wheelchair cushion that is unsurpassed in pressure redistribution. The Gel Pro™ Elite is utilized to provide unsurpassed patient comfort and in the prevention and treatment of pressure ulcers. Our segmented gel bladder contains an aqueous, highly viscous gel which provides for proper immersion and envelopment around the bony prominences. Gel-Pro™ gel wheelchair cushions help to stabilize and reduce the “rocking” motion found in other types of gel cushions. The Gel-Pro™ line of wheelchair cushions are covered in a traditional waterproof vinyl and low-shear nylon material, which helps reduce heat and moisture build-up. Both materials are fluid and stain resistant, anti-microbial and meet California Technical Bulletin #117 for fire retardancy. 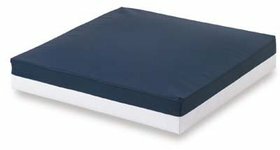 This versatile reversible gel wheelchair cushion utilizes the same gel formulation and bladder design as used in the Gel-Pro™ Elite cushion.The low shear nylon cover is anti-mircrobial and fluid-proof to protect the inner core. and fluid-proof to protect the inner core.